With his selection by the Marlins the November 1992 expansion draft, Jeff Conine saw the possibility of that playing time being extended. Over the previous three seasons, Conine had seen time in all of 37 major league games with the Royals. With the Marlins though, it appeared there were some openings. "With no other real option at first base (in Florida), I think it will give me a good chance to play every day," Conine told The Associated Press after his selection. "I feel good getting in on the ground floor of an organization." Conine got in on the ground floor of the organization. He also eventually became synonymous with it, earning the moniker "Mr. Marlin," helping Florida to two world championships. Conine's path to the Marlins began in 1987, signing with the Royals as about as late a round pick as there could be - taken in the 58th round out of UCLA. 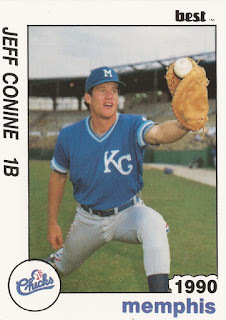 Conine didn't start play for the Royals, though, until 1988, playing his first two seasons at single-A Baseball City. He moved to AA Memphis in 1990, getting his first call to the majors that September. In nine games for the Royals, Conine went 5 for 20, hitting two doubles. Wrist and rib injuries limited his playing time over the next two seasons. He didn't play in the majors in 1991, then played just 28 games with the Royals in 1992. With the Marlins, though, Conine left the minors behind. In his first year, he played in all 162 games, hitting .292 with 12 home runs. He also came in third in the Rookie of the Year balloting. In May, he hit his first home run for a grand slam, then won the game in extras on a single. "Coming here was the best thing that ever happened to me," Conine told The Philadelphia Inquirer in August. "There were road blocks in Kansas City, with (Wally) Joyner and (leftfielder Kevin) McReynolds." Conine followed up that season with his first All-Star campaign in 1994. He hit .319, with 18 home runs. He made the All-Star team for a second time in 1995 with a .302 season with 25 home runs. In the 1995 Mid-Summer Classic, Conine hit the game-winning home run, earning MVP honors. "You dream of this your whole life," Conine told reporters afterward. "You get in a situation like that to win a ball game in the late innings, it's a dream come true. It's the biggest rush of adrenaline I've ever had." In 1997, Conine helped the Marlins to their first world championship. Conine, though, was part of the Marlins' salary slash, traded back to the Royals for 1998. Conine played 1998 with the Royals, then moved to the Orioles for 1999, staying there into 2003. With the Orioles, Conine hit .311 in 2001. In August 2003, Conine returned in another trade to the team where he first had success, the Marlins. He also helped them win their second title. Conine hit .333 in the World Series, scoring four runs. Conine played with the Marlins for two more seasons, then went through four other organizations, ending his career in 2007. In spring 2008, Conine signed a ceremonial contract with the Marlins, so he could end his career with them. For 2015, Conine is continuing with the team, as special assistant to the president. "To go from the beginning and where we were in 1993, a rag-tag organization," Conine told The AP upon his retirement, "to winning a World Series, that's something very special."